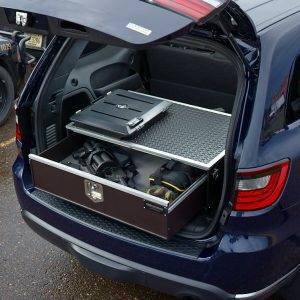 Our smartly designed storage systems are built tougher than standard plastic drawers to withstand the most extreme conditions. Each series is designed for use in a specific vehicle to create the most high-performance, custom-fitted storage solutions on the market. 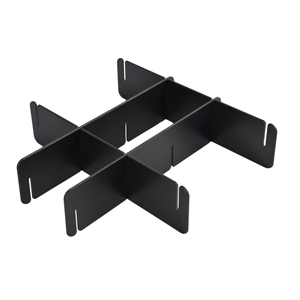 All storage drawer units are equipped with a compression T-Lock to secure valuables. Locks engage behind the aluminum frame for greater security, and storage units with two locks are keyed alike for added convenience. These models are designed for use in an SUV. 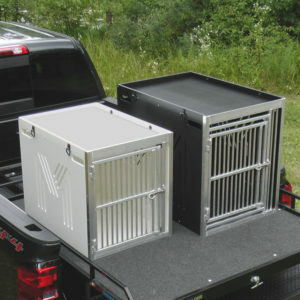 These models are designed for use in a Pickup Truck. 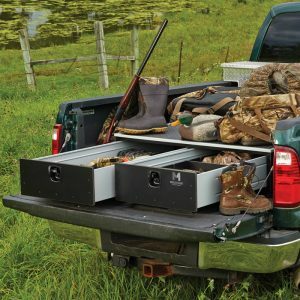 Built Tough… with the same sturdy construction as our storage drawers. Customize your storage drawers with dividers, gun racks, rubber drawer liners, pick n pack foam, customized nameplate or a combination lock. We have used our manufacturing capabilities and have contracted with Ergonomic Solutions to supply major insurance companies with solutions that are suited for professionals that are required to work on the road or are in need of an on-site temporary office. 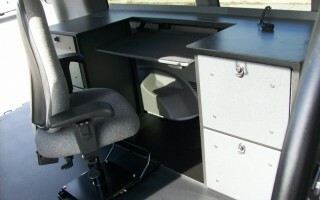 Fleet vehicle projects include ergonomic workstations for van and car models. Everything is manufactured with safety standards and ergonomic principles in mind. Create a model to fit your vehicle! Use the MiY HDP Designer Tool to enter your measurements, choose your accessories and calculate the cost of your very own model.